Admission is free each first Wednesday and third Saturday of the month, thanks to support from Salt Lake County Zoo, Arts and Parks (ZAP). Free access may vary for special ticketed exhibitions. The UMFA supports Museums for All. Present a Utah Horizon or EBT (Electronic Benefit Transfer) card and valid photo ID to receive free admission for 1–4 visitors. The UMFA is a Blue Star Museum, offering free admission to active duty military personnel and their families (up to 6 visitors) with military ID. The Museum is located in the Marcia and John Price Museum Building at 410 Campus Center Drive on the University of Utah campus, between Rice-Eccles Stadium and the Jon M. Huntsman Center. The UMFA is easily accessed by TRAX. We are located just a five-minute walk northwest of the University South Campus stop on the University (Red) line. Click here to plan your trip. The UMFA is easily accessed by the following UTA bus routes: 17, 213, 223, 228, 313, 354, 455, and 473. Click here to plan your trip. From the north or south: Travel on I-15 and take the 600 South exit. Turn left on State Street and right on 400 South. Head east on 400 South (which becomes 500 South) to the light at Campus Center Drive (at 1580 East). Turn left on Campus Center Drive, veering right on to South Campus Drive. Turn left at the next light on to 1725 East, the Museum will be on your left. From the east or the west: Travel on I-80 to Foothill Drive. Take Foothill Drive north to Mario Capecchi Drive. Turn right on Mario Capecchi Drive and left onto South Campus Drive. Turn right onto 1725 East, the Museum will be on your left. Free and pay parking is available for weekday visits. Campus parking is free on weekends, except in reserved stalls. Turn left on 1725 East, then right into the lot east of the Museum and park in any stall labeled UMFA Visitor Parking. Register your license plate number at the welcome desk to avoid a parking citation. Turn left on 1725 East, then continue as road curves to the east (the Business Loop) and look for the visitor pay lot on your right—be sure to prepay at the kiosk. The UMFA often hosts programs on Wednesday nights, when the Museum is open until 9 pm. On those nights, museum parking is free after 6 pm in the lot east of the Museum and in the parking garage around the corner from the pay lot. Check backpacks, large bags, and umbrellas at the welcome desk. Groups are encouraged to leave large bags at home, school, or on the bus. The UMFA welcomes all visitors and strives to be accessible to everyone. Visit the Accessibility page for more information. Family backpacks, a Family Guide, and more family-friendly activities are available for free at the welcome desk and around the museum. Visit the Families page for more information about family programs in the Museum and around the community. Need a break? Comfy seating, additional art content, and charging stations are available at the Trailhead, Basecamp, and Lookout conversation areas. Check out our free audio guide to discover more about the art on view. While at the Utah Museum of Fine Arts, you may be photographed, filmed, and/or otherwise recorded. Please let us know if you do not give your consent. Photographs may be used for personal, non-commercial use only and may not be distributed. No flash photography is permitted—intense light damages the artwork. No tripods or large camera bags are permitted in galleries, bulky equipment may damage objects. Photography is not permitted for objects or galleries identified with a "No Photography" symbol. No video recording is permitted in the Museum. Click here to request image reproductions of objects from the permanent collection. Groups of 10 or more should make advanced reservations to avoid conflicts with other tours or special programs. Contact the tour coordinator or call 801.581.3580 to schedule a group visit. Free coat check and lockers are available. Backpacks, large bags, and umbrellas must be checked at the welcome desk or placed in lockers. Single gender-neutral restrooms are located on the first floor by the temporary exhibitions gallery and on the second floor adjacent to the modern and contemporary gallery. Changing stations are located on the first floor in the restroom near The Museum Café and the restroom by the ACME Lab, and on the second floor in the restroom near the modern and contemporary gallery. 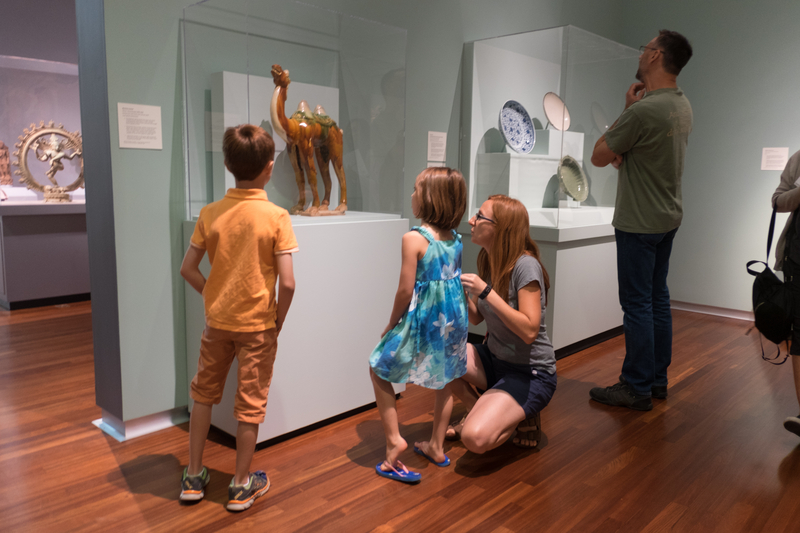 Preview the Museum's galleries and amenities before your visit. Click here to view or download the Visitor Guide. Get a sneak peek of some of the most popular artworks on view in the Museum's galleries. Click here to view or download the Highlights Guide. The UMFA periodically sends out information via e-mail regarding upcoming exhibitions, events, lectures, films, classes, and more.